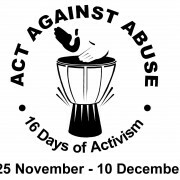 IMATU supports 16 Days of Activism Against Gender-Based Violence. This international campaign runs every year from 25 November, the International Day for the Elimination of Violence against Women, to 10 December, Human Rights Day. The purpose of the campaign is to draw attention to the very real and serious threats facing women and children in our country and communities. IMATU members are encouraged to show their support by wearing a white ribbon and reporting suspected abuse.